Thomas Murray and the Upside Down River, the latest work from award-winning screenwriter of Last Cab to Darwin, Reg Cribb, visits the Department of Tourism and Culture’s Araluen Arts Centre this March as part of a national tour. The Department of Tourism and Culture’s Araluen Arts Centre has invested $170,000 to stunningly refurbish its Box Office, providing easier wheelchair access and better flow for Territorians and visitors to the precinct. 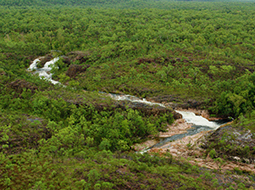 Minister for Tourism and Culture, Lauren Moss announced today a $12.1 million boost to open up new areas of Litchfield National Park to visitors, working with key stakeholders. The Department of Tourism and Culture’s Araluen Arts Centre is pleased to announce the return of its Art House Cinema program for 2018. The Department of Tourism and Culture’s Screen Territory has provided funding of $17,000 in travel grants for 10 of the NT’s leading documentary film makers to attend the 2018 Australian International Documentary Conference (AIDC). The Department of Tourism and Culture has launched Round 2 of the Officiating Development Program which provides grants to strengthen the quality of sport in the Territory. The rightful home for a National Aboriginal Art Gallery is Alice Springs, on the doorstep of Namatjira country, Minister for Tourism and Culture, Lauren Moss said following comments that it should be based in Adelaide. The Territory tourism industry just got an added boost with the launch of Paspaley’s luxurious flying boat venture tours. Katherine will receive a $5.5 million investment into tourism infrastructure to expand walking opportunities in Nitmiluk National Park as part of the Territory Labor Government’s record $103 million Turbocharging Tourism stimulus package. Around 2,000 Central Australian footy fans were treated to fast paced thrills and spills at the AFL Women’s game in Alice Springs over the weekend.